I dislike making New Year’s goals with a fiery dislike. I don’t like making them, because here comes March, and my goal-efforts stopped back somewhere around GroundHog Day. I’m going to finish some of the knitting WIPs scattered around my house. I’ve gotten out about ten or so WIPs, organized them in bags with instructions, notions, and whatever else I will need to finish them. Each bag is labelled with a little hang-tag. I can do the projects in any order; however, I can only work on one project at a time. One exception: If the knitting project I am focussing on is a Must Concentrate Don’t Bother Me project, and I need mindless knitting for waiting or being in a car, I can then work on a mindless project. However, only one mindless project. Focus, focus, focus. I hope this will help me get some things DONE!! Another sub-rule: I can work on One Spinning Project, One Sewing Project, One Must Concentrate Knitting Project and one Mindless Project, all in the same timeframe. But ONLY ONE project per area. Focus on one at a time. Hopefully when Mr. Groundhog Shows Up, I’ve have a wee stack of Finally Finished Objects waiting to show him. Speaking of which……..ta – DA!! 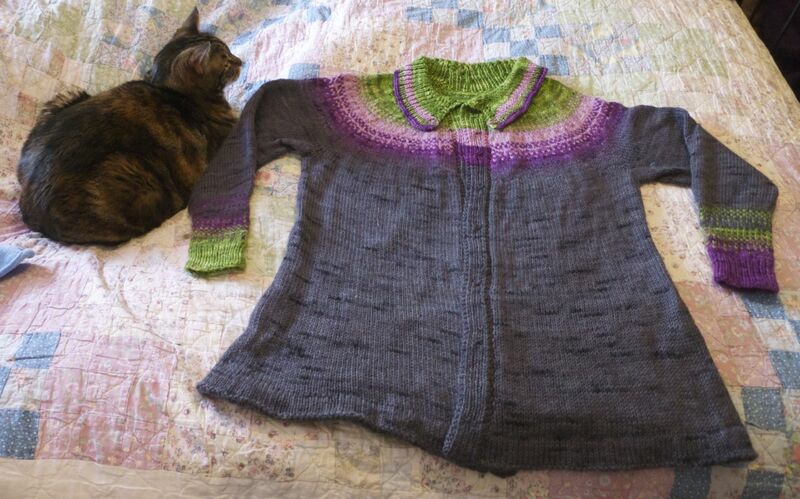 Pattern: Hiro, by Julia Farwell-Clay. Modifications: Semi-shawl collar; opposite-colour cuffs, body shaping. Oh, you want to see it on me, do you? As it happens, all of us liked the single button at the top; Tim wanted to use other buttons all the way down. 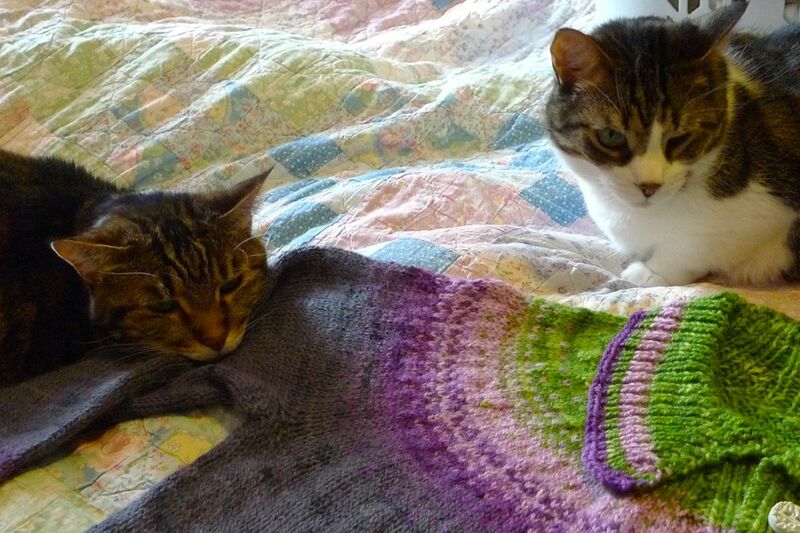 Zoe and Tim take a moment to calculate the snuggle-factor of the sweater. I absolutely loved knitting this sweater. Someday I want to do it again using a gradient of natural coloured wools. Mostly, however: I’m so proud to be done with this! 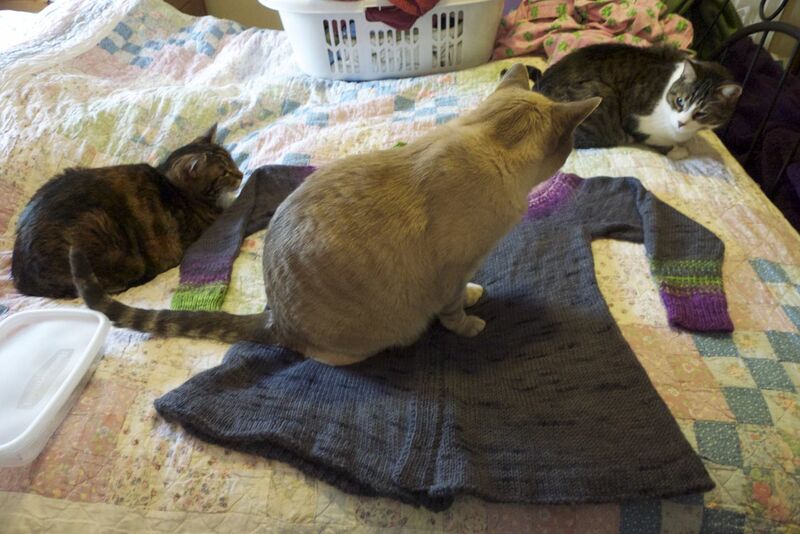 We shall completely ignore the fact that this was supposed to be my Rhinebeck 2013 sweater. Thank you. ~ Brooklyn’s Botanic Gardens have some rare and beautiful plants on display. ~ One doesn’t normally expect a TV show to construct costumes with expensive fabrics, and an eye for detail that would make a museum curator cry. These, however, are exquisite. ~ Need a laugh or five? ~ Powerful. Who are you, and who are you not? ~ And last but not least: Finding Nemo, starring kittens instead of fish. I’ll have more of everything next time, including a Quilt Update, and more wacky stuff as usual. This entry was posted in Uncategorized and tagged buttons, Cats, colorwork, Hiro, Knitting, TimKitten, ZoëCat. Bookmark the permalink. Too warm here for the season, quite frankly… We set high temp records the past two days and prob. will again today. Warmest place in Canada yesterday was Haines Junction, YUKON! I have the same goals, sort of…and can’t start anything new. I have everything finished except for a pair of BLACK alpaca socks. Have to break down and start something I can work on in the evening. Black is impossible. Bitterly cold here. Have me Hot Booties on. AH!!! I’m either frogging or finishing what’s on my spindles and needles before I start anything new. Which doesn’t seem to stop me from buying more things, just from starting them. This year’s goal is to finish more than I bring back in. Lovely sweater on a lovely woman — glad the cats approve! The buttons, oh, the buttons! They are the perfect touch for that sweater, which looks so perfect and cheerful on you. Glad to see your smiling face, Sandi! 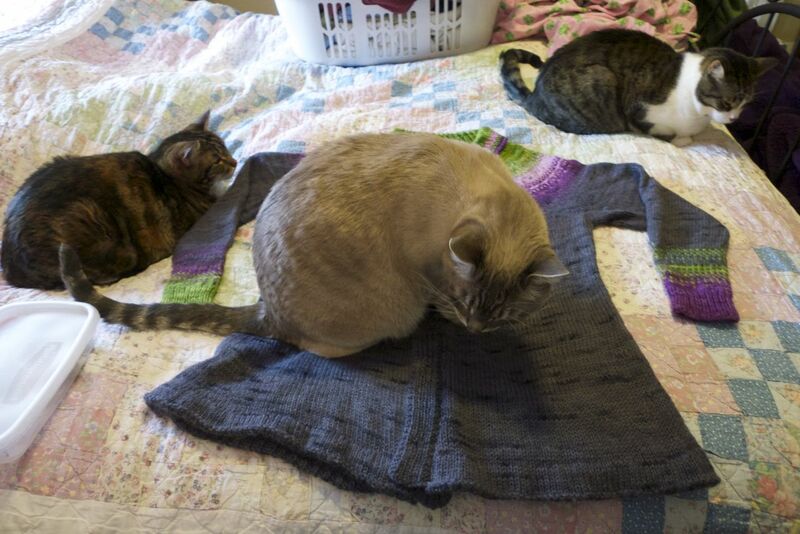 my feline knitting associates are busily engaged in their own new year’s resolution to spread my wips across the living room floor every night when i go to bed – and you should just see what they’ve done to my quilt project! they need lessons in politeness from your little guys – and i need to put my things away when i’m not working on them! Beautiful sweater! It looks absolutely perfect on you! I found you! I’ve so missed seeing your wise words in Knitting Daily. Now I can enjoy them again.Why didn’t I think to Google Sandi Wiseheart sooner?? Welcome back! I’ve missed your quiet, wise voice. No pun intended. 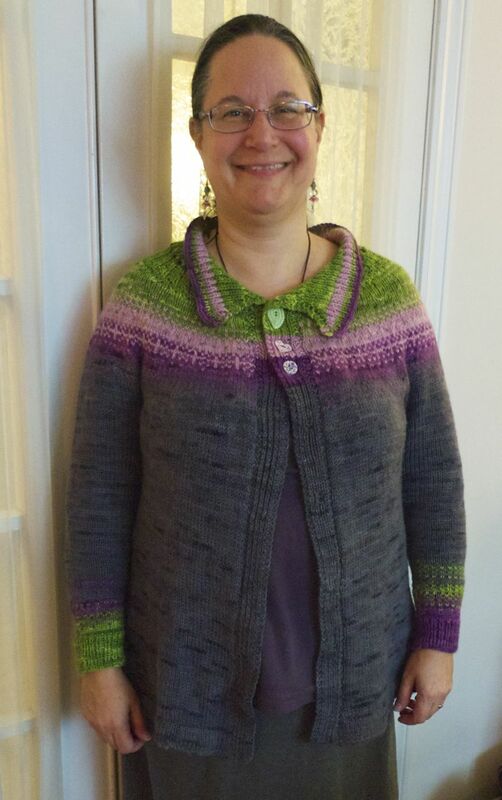 The sweater looks lovely on you, and I especially like that wee leaf button. Just the right touch.